Barbleberries are berry-producing bushes which grow in coastal areas near the water, such as along the shore of southern Grahtwood. The small red berries, when harvested can be used as a powerful diuretic. 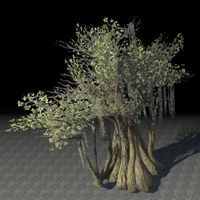 Banyan trees are often found growing in swampy areas all around Tamriel. 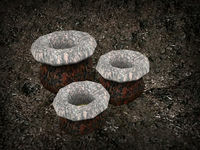 They can be purchased from housing furnishers to be planted on peoples' properties. Bat Blooms are purple plants that can grow to large sizes. 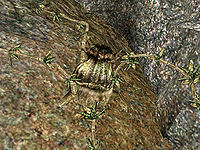 They can grow on Vvardenfell in the Bitter Coast, Ascadian Isles, and Azura's Coast regions. 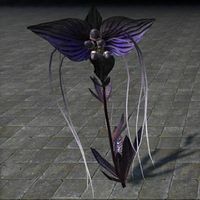 They can also be found in Mephala's realm, the Spiral Skein. 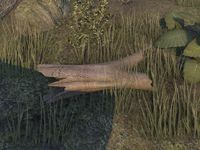 Beech trees grow all around Tamriel, though are mostly seen as fallen logs, which can be harvested to craft Beech items. 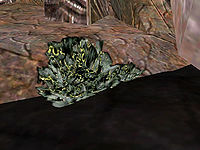 Belladonna are the yellow-green shrubs that grow in the warmer regions of Solstheim. When consumed, the berries are said to purge the body of evil energies. 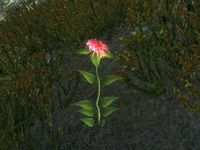 A tall, thin plant with a dark pink flower bloom, found growing in the Nibenay Valley and northernmost part of the Great Forest in Cyrodiil. 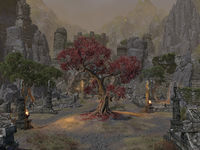 Birch trees grow most notably in the Jerall Mountains and the forests of The Rift. 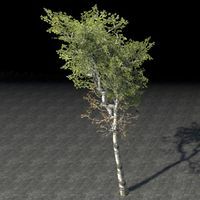 The wood can be found in many places and is harvested to craft Birch weapons and armor, namely bows, shields and staves. Birch trees are also available from housing furnishers to be planted on homeowners' properties. A vine that usually appears in thickets. It is abundant in the West Gash region of Vvardenfell. Bittergreen is a safe and nourishing food when it is boiled but is highly toxic if eaten raw. 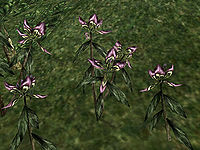 Black Anther is a flowering plant that grows on the Ascadian Isles and Azura's Coast regions of Vvardenfell. Black lichen is a somewhat rare, primitive plant that survives well in harsh conditions and grows on rocks. 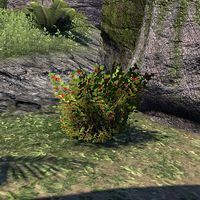 A short berry producing shrub found on farms across Cyrodiil, and wild in the province's West Weald region. Blanched Russula Cap is an exotic mushroom that grows in Barrow Trench in Greenshade. Its' white color is so bright that it apparently seems to glow. 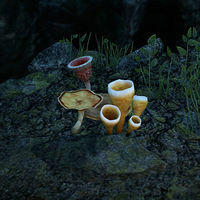 A short, red-capped mushroom found growing in the caves of Skyrim. 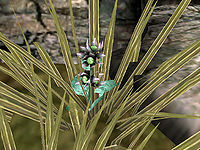 A plant with many spade-shaped green leaves growing from a central stem that can be found growing across Tamriel. 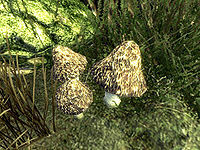 Blight Bog Mushrooms thrive within the Blight Bog Sump in Murkmire. They are incredibly nutritious, and can be used to make a miraculous fertilizer. 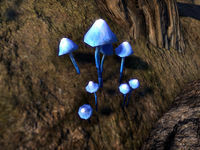 A short, grey-colored knobbly fungi found growing in the Dementia side of the Shivering Isles. 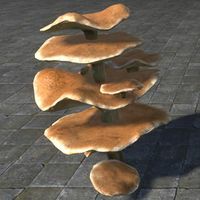 A brown-capped mushroom found growing in the caves of Skyrim. 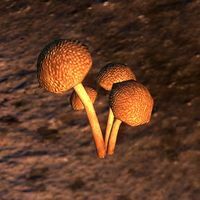 Bloatspore is a spore-producing fungus that grows in dark, damp locations. 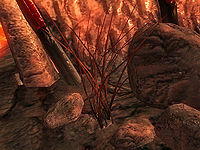 Bloodcrown fungi grows in large subterranean caverns. While the Bloodcrown's cap is red, its' spores have the unusual property of producing a blood-like liquid. 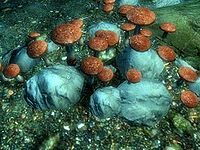 A notable example of this fungus' habitat is Merion's Bliss in Auridon. A tall, red-colored reed commonly found in the Deadlands. Bloodthorn Vines are giant, writhing, thorned vines associated with dark Reach magic. They are used by the Bloodthorn Cult and the Boneshaper Clan. The plant is not native to the Reach, but is cultivated well by the Reachmen. The Boneshapers use the vines in an unusual number of rituals, from lacing or growing them through the skeletons of their living sacrifices to shaping them into rough effigies before battle in mockery of life. Despite the use of the dead in several rituals, the Boneshapers forbid the practice of necromancy. On the other hand, the Bloodthorn Cult used the vines for a much more malevolent purpose, spreading them to corrupt the land and planting the seeds in the corpses of the dead to raise them as zombies. These vine-covered zombies lived in a painful state of undeath. The cult's leader, Angof the Gravesinger, suffered from a similar existence to the zombies after making a pact with Molag Bal, although he seemed to think that it could be reversed. 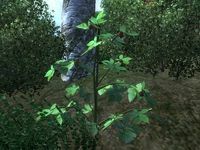 During the cult's campaign in 2E 582, the vines were spread throughout Glenumbra and Betony. 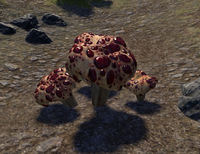 Bloodtooth Toadstools grow naturally on Vvardenfell. Not to be confused with Steel Blue Entoloma, Blue Entoloma is a small, vibrant blue fungi that can be found growing across Tamriel. 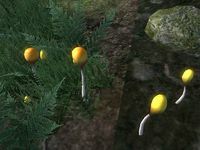 A medium-sized fungi with a round, yellowish cap commonly found in the Blackwood region of Cyrodiil. 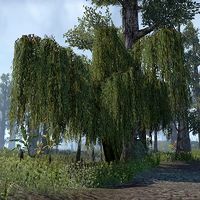 A large tree found in the swamps of Murkmire, the pleasant-smelling oil it produces protects it from rot. However, if the oil comes in contact with certain substances it is known to have an explosive effect. The Briarheart Tree in the middle of Frostbreak Fortress. A strange tree with red leaves that is the source of the infamous Briarhearts. They have been seen in Frostbreak Fortress, cultivated by the Winterborn Reachmen. 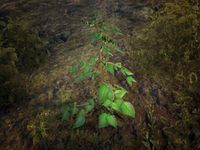 Briarheart Saplings, a juvenile form of the tree, are planted in corpses. The smaller trees connect to the large tree through a system of roots. The fruit produced by the trees is used in rituals by Hagravens to resurrect Reachman warriors as Briarhearts. It is a great honor to be chosen for this transformation. The fruit is plunged into a dead warrior, and they are resurrected with greater strength and fortitude. 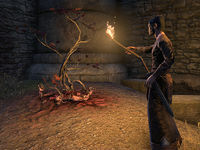 Any corpse can serve the purpose of being resurrected by the fruit of a briarheart tree, but the ritual holds great importance for warriors of the Reach. A Briarheart Sapling being burned. Note the corpse it has sprouted from. 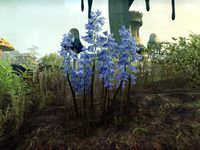 A large plant with purple-blue flowers that can be found growing across Tamriel. 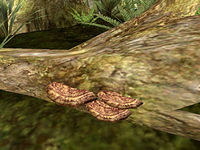 Bungler's Bane is a mottled brown-and-orange shelf fungus collected from the trunks of trees in Vvardenfell's Bitter Coast region. 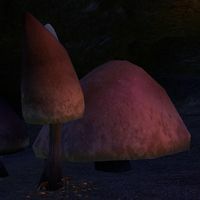 These flat-brimmed mushrooms live in caves and on Vvardenfell. They bear an uncanny resemblance to pancakes. ^ Blanched Russula Cap item description. 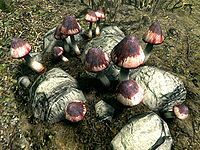 ^ Tuwul's dialogue from Mushrooms that Nourish in Murkmire. ^ Bloodcrown Spores item description. 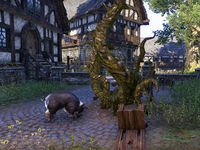 ^ A letter from a Reachman discussing the Briarheart Trees and their fruits. This page was last modified on 9 March 2019, at 21:47.